MDa with 35mm Olympus finder and 24mm Zuiko. 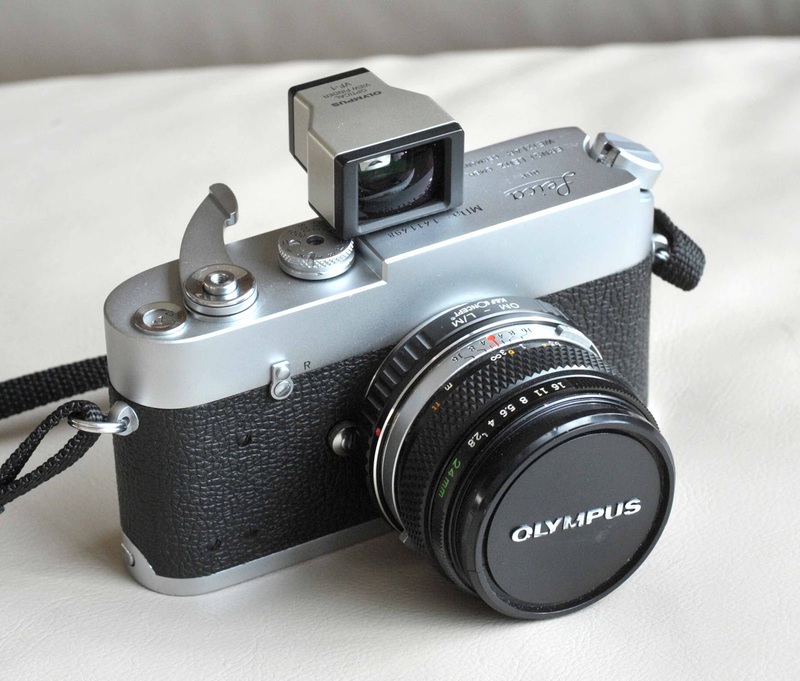 As revealed in an earlier post, I'm planning on using a 24mm Zuiko lens from my Olympus SLR outfit on the viewfinder-less Leica MDa or the M2 along with a separate finder in the cold shoe. I ordered the adapter for the OM lens from Amazon (adapters for other SLR makers' lenses are also available) and it came the following day. It's a K&F Concept brand that was about £17 and first impressions are good. The adapter, described as an "OM-L/M", looks to be quite well engineered although some slightly rough edges show where savings have been made. They're nothing problematic but had this been, say, a £150 Leitz adapter, every part would have been finished to the same high standard. I'd give the build quality and finish about 6.5 out of ten. Not stellar but certainly good enough to do the job required. Everything lines up nicely with the focus and f-stop marks in the right place. Everything considered, I think the Zuiko looks fine on a Leica. 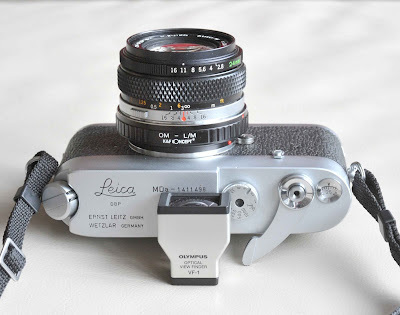 The adapter fits onto the Leica M mount very well indeed, clicking securely into place and showing no signs of wobble or looseness. 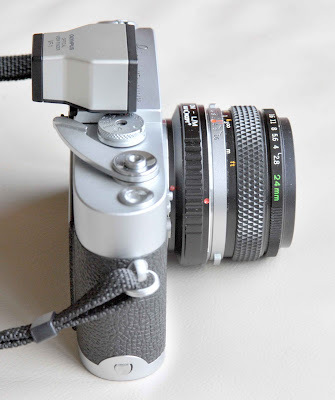 It also attaches well to the Zuiko but requires just a little bit more effort to slide it round and lock it into place. With the lens attached to the camera, I can find no sloppiness or wobble anywhere. It's a good, solid adapter that seems to have been made with quite fine tolerances. The interior of the adapter appears to be well blackened so, hopefully, flare won't be an issue. So far, so good. 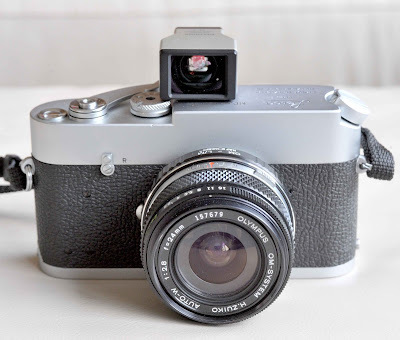 There's no physical connection with the M2's rangefinder and the MDa doesn't have one so hyperfocal or zone focusing are likely the order of the day. With a 24mm lens stopped down to f8, depth of field at 8 feet stretches from 4 feet to infinity so it's not much of a problem. Even at f4 you're getting 9 feet to infinity in focus. Of course, some people have a handy knack of being able to estimate distances quite well and will find this sort of thing a breeze. out of place at all. 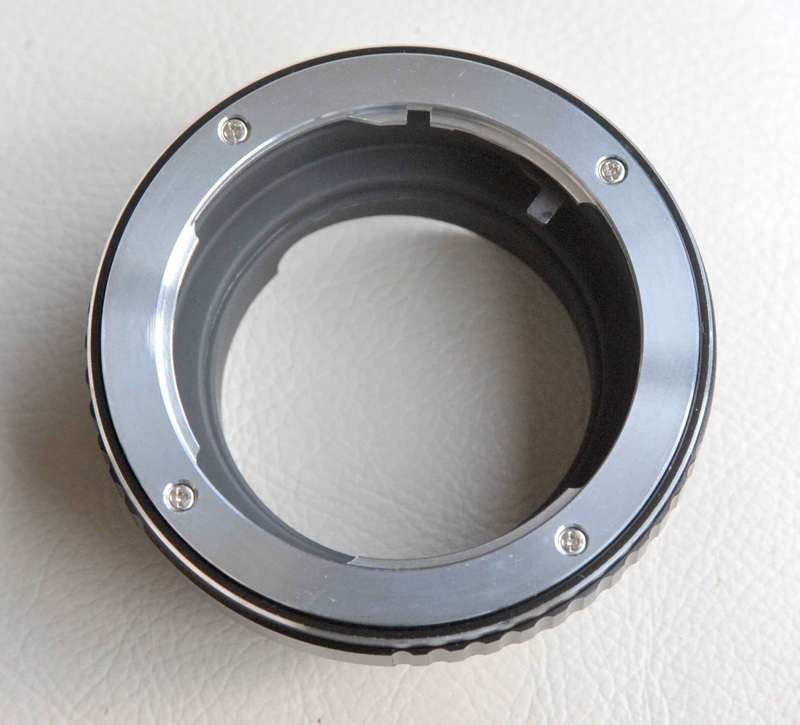 There's no need for any glass elements in the adapter to enable infinity focus to be achieved so, in theory, I should be able to get the same lens quality from the Zuiko/M2 that I get using the wide angle on an Olympus body. That's very decent quality indeed. The 24mm f2.8 Zuiko has yet to disappoint me and I've used it quite a bit. With the lens mounted, the stop-down lever is depressed so you're always at the indicated aperture. That means that even if your Zuiko has lazy aperture blades, not uncommon with some older lenses, it would still be usable in this fashion. 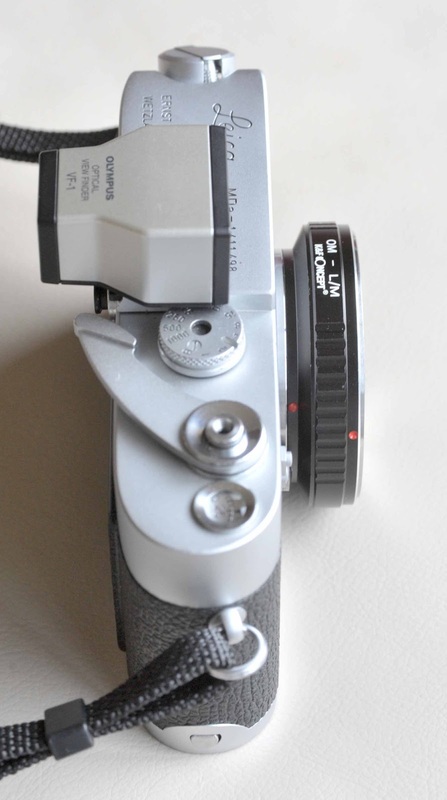 The Zuiko, were it possible to attach it to the camera without an adapter, would be quite a good match size-wise for the MDa. Yoshihisa Maitani, the designer of the OM line, was a great admirer of Leica cameras and deliberately tried to match the dimensions of his SLR masterpiece to the rangefinder so it's no surprise that the compact Zuiko prime looks the part. 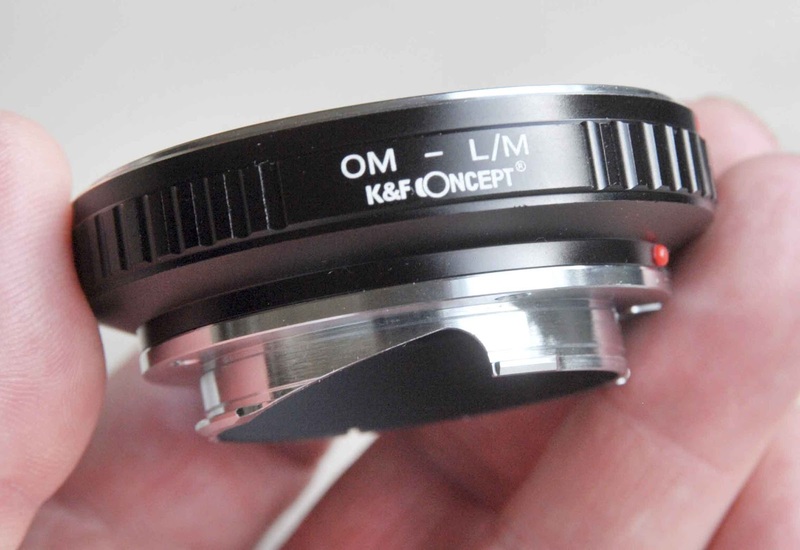 With the K&F Concept adapter, it grows by about 18mm and doesn't look as good although it's by no means an ugly union. 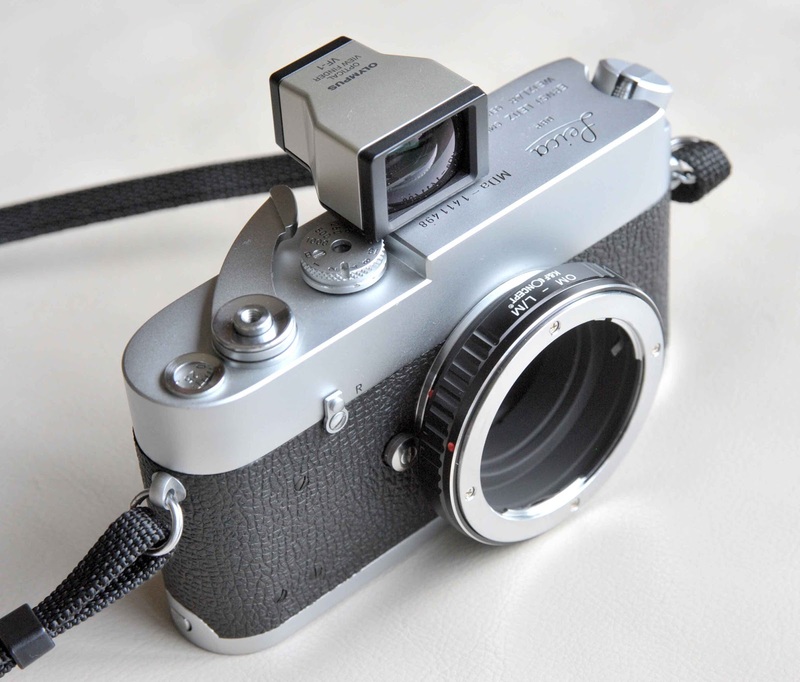 The lens won't intrude, I don't think, into the field of view as seen through a separate finder on the M2 or MDa. 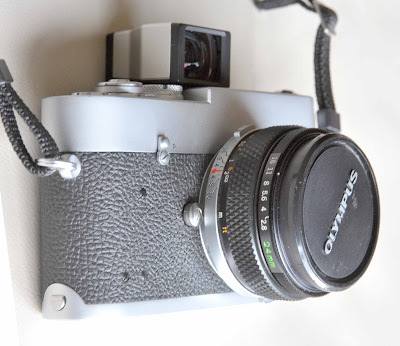 Yes, a 25mm Voigtlander Skopar would look neater but the Zuiko promises to be just fine. Just a case of lining up the dots. 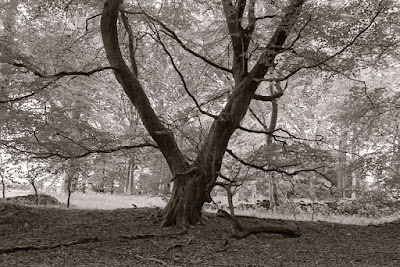 I've not had a chance yet to take some photos with the Zuiko in place but will do in the next day or two, just guessing the framing or maybe using a 24mm lens on an SLR to indicate the field of view. With a 24mm or 25mm viewfinder in place on the M2 or MDa, I can't really see there being much difference in use between the Zuiko and an equivalent Leica or Voigtlander lens. There is, however, a big difference in price. That looks superb Bruce and is nicely anonymous - really looking forward to the results! Forty-five years ago I bought a LTM to M42 adapter (by Pentax). It really wasn't for using with a M42 lens, but the No. 1 Pentax extension tube added made it the correct register. Over the years I fooled around with it on my IIIf. Now that I have a Bessa R the bright line finder for 35mm lenses make the whole scene about the same as a 28mm M42 lens. I've had fun with it as well as using a Zenitar 16mm lens. I scale focus at f8. I hope you enjoy your new toy. That looks very neat. Is there some way to fix a Zuiko lens to an Olympus body? Haha. Good point! I did think it would be easier to stick the OM2 with the 24mm in the bag along with the M2, especially since the MDa will probably only see duty with a wide angle on it. But that goes against the whole rangefinder ethos! Where's your romantic side, David? Looks great Bruce. Exploring the world of adapters these days is great fun and economically a practical pursuit. I've a lot to learn about adapters but probably anything is possible. 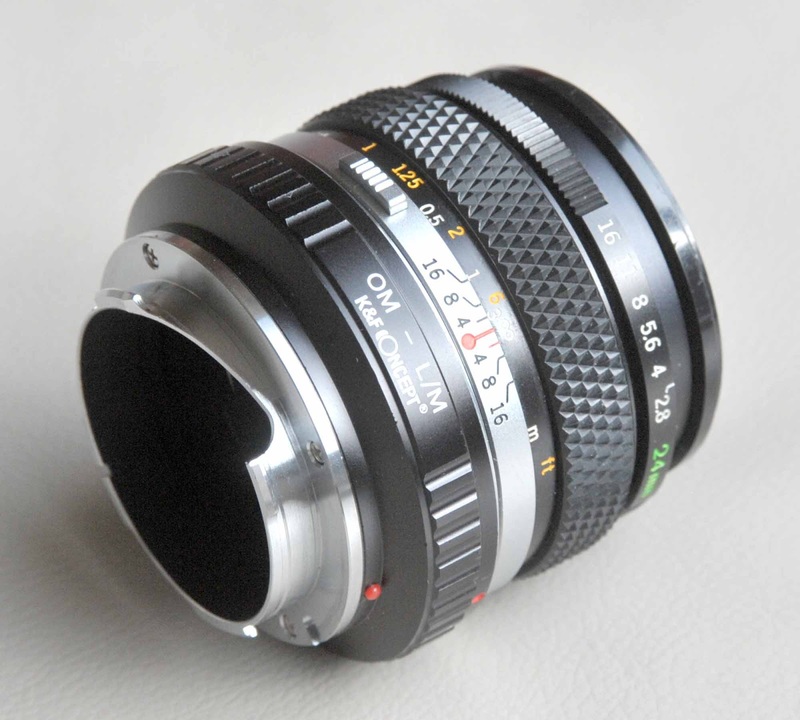 I've used my Praktica P6 medium format lenses on M42, nikon and leica IIIf. Its good fun scouring Ebay for adapters when finances dictate new cameras or lenses can't be added to your shopping list. Have you considered visoflex for leica MD Bruce ? Sadly, I have Andy. 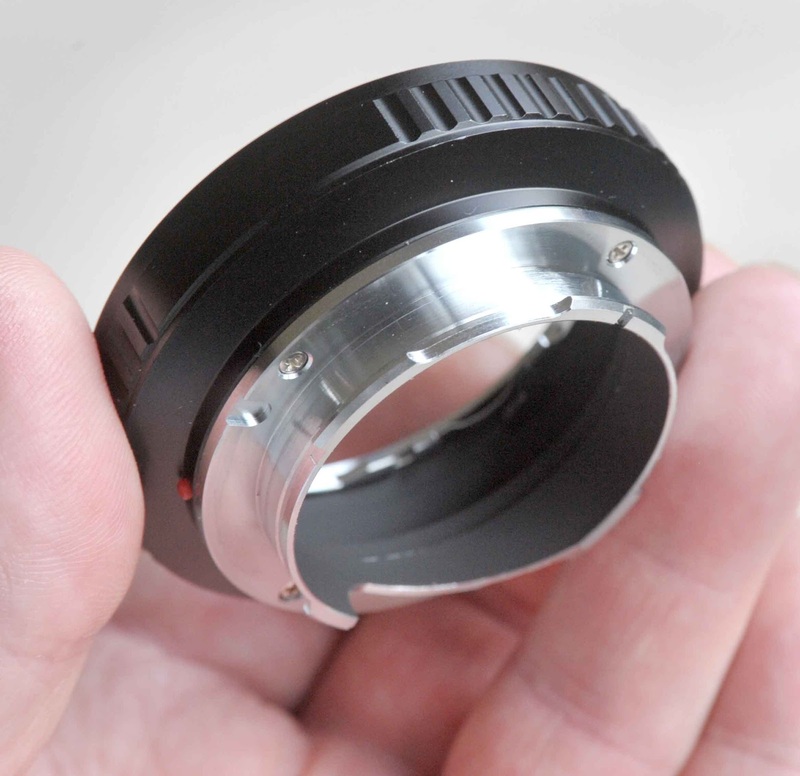 Not for the 24mm, though, but for a Tele lens. I'll probably get by fine with a 90mm on the M2 so we'll see how it goes. Romance, eh? The romance of the Leica has passed me by, perhaps because of the first Leica users I met. One was an accountant with all the characteristics one would expect if he'd been a character in the Beano. The other suffered from echolalia. 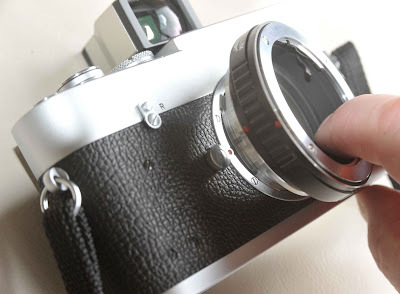 I can see the attraction of having the wind-on lever and shutter button in the same place. I'm looking forward to the Visoflex. Well, I'm looking forward to the hand-woven wrist strap, too. That's interesting, David. I had the same sort of experience when I met the first LF guys. Weird? What a right bunch of liberal democrats. You'll not have too much longer to wait for the DIY wrist strap. The 25ft of paracord arrived in the post this morning. Very like the Lib/Dems; almost entirely harmless.